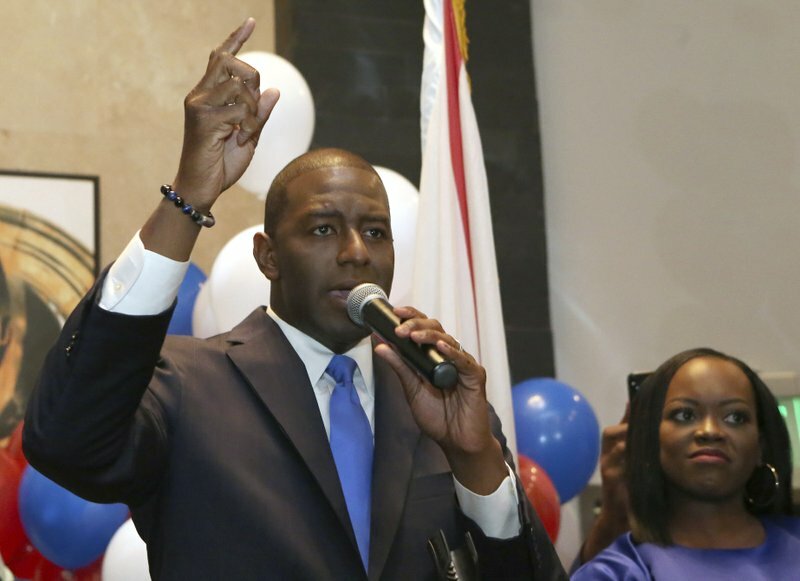 With Andrew Gillum’s upset victory in Florida, Black candidates have won the Democratic nomination for governor in three states this year in a historic turn largely attributed to voter backlash against President Donald Trump. Gillum, Stacey Abrams in Georgia and Ben Jealous in Maryland were all aided in recent months by strong turnout, especially among Black voters. Voters have elected just two Black governors in U.S. history — in 2006 in Massachusetts and 1989 in Virginia. Abrams and Jealous face uphill battles in November, while Gillum’s contest is expected to be close. They will have to figure out how to translate the enthusiasm among primary voters to the general election, and will have to win over moderate Democrats, independents and probably some Republicans. In fact, race became an issue in the Florida contest on Wednesday, the morning after the primary, when Gillum said voters aren’t looking for a misogynist, racist or bigot, and the Republican nominee, Rep. Ron DeSantis, said Floridians shouldn’t “monkey this up” by choosing his African-American opponent. The Florida Democratic Party decried DeSantis’ comment as racist, an allegation his camp called absurd. Abrams, Gillum and Jealous represent the more liberal wing of the Democratic Party, with backing from Sen. Bernie Sanders, and Republicans are already casting them as too liberal for their states. Florida and Georgia voted for Trump in 2016, while Maryland went for Hillary Clinton. Just hours after Gillum won his primary, Trump went on Twitter to call him “a failed Socialist Mayor” and point out the crime rate in the city Gillum leads, Tallahassee. The state capital has had one of Florida’s highest crime rates in recent years, although it’s been going down. Abrams, a former minority leader in the George House, faces Brian Kemp, Georgia’s secretary of state. Maryland is more friendly territory for Democrats, but Jealous is challenging a popular incumbent, Republican Larry Hogan. History also provides a reality check: Other Black candidates for governor with much higher profiles have failed — most notably former Los Angeles Mayor Tom Bradley and former Atlanta Mayor Andrew Young, who didn’t even survive his party primary. The hope for all three of this year’s candidates lies in a surge of turnout from Black and liberal voters similar to the one that carried Barack Obama to the presidency 10 years ago. In Florida, Gillum defeated four other Democrats — none of them Black — on Tuesday. While his campaign was outspent, Gillum was backed by millions of dollars in independent spending by Tom Steyer and George Soros, among the wealthiest supporters of liberal causes. Gillum prevailed in a state where Blacks are about one-sixth of the population. The political action committee New Florida Vision endorsed him in June and spent the next two months registering 19,000 new voters, knocking on 40,000 doors and reaching out to 200,000 people through text messages, mail or social media. The goal was to engage the kinds of black voters who helped Obama but didn’t show up in the 2016 elections. Associated Press writer Brian Witte in Annapolis, Maryland, contributed to this article. Whack is The Associated Press’ national writer on race and ethnicity. Follow her work on Twitter at http://www.twitter.com/emarvelous . Follow Mulvihill at http://www.twitter.com/geoffmulvihill .